Historical clothing is a major interest of mine: not the elaborate costumes of court, cathedral, and carnival that are badly redesigned in Cecil B. deMille epics, or even well-represented in the better theater and film efforts of more recent years; no, my interest is in the everyday clothing of the ordinary person, such as I might have been if I lived a dozen centuries ago. As I became involved in the Craft, I found that there are correspondence lists for almost every class of substance I could dream up—herb, color, and musical pitch, rocks, crystals, and precious stones, planets, stars, and constellations—but nothing I’ve read treats at all with the everyday take-it-for-granted magic of fiber, clothing, and garments. In the course of developing some classes that apply textile and costume history to pagan clothing, I’ve developed the following fiber correspondences. There are four major natural fibers used now and historically in Western clothing manufacture: linen, wool, cotton, and silk. Among these four, I find several polarities. Linen and cotton are vegetable fibers and generally cooler to wear, while wool and silk are animal fibers and insulate the wearer, so that in Northern climes they are used to warm, while in the tropics they serve to cool. I associate the vegetable fibers with Mother Gaia and the Green Man, while the animal fibers evoke Herne the Hunter and Clothos. The sturdier fibers, linen and wool, correspond to the feminine, while the more ephemeral cotton and silk correspond to the masculine. long, sturdy fibers explain the folk tale descriptions of women spinning until their fingers bled. Such fiber naturally makes a strong thread and stronger fabric which softens only slowly with wear. Linen has been historically used for rope before hemp was available. Linen sheets require ironing to smooth them into a surface comfortable for sleep. The newest steam-iron still gives “linen” for its hottest temperature setting—and even so, most linen needs to be ironed damp in order to relax the fibers and smooth the surface. Like the element of Earth, linen is tough stuff. Caption: This composite photo illustrates many steps of making Irish linen. Linen goods, like all household fabric goods, were valued highly over the past millenia. Victorian households inventoried them, sent them for laundering with a laundry list to prevent theft, and repaired them regularly. Long before that, in medieval households, linens were inventoried, itemized, valued, and specifically distributed to heirs in wills. Household linens spun or woven, decorated or collected by young girls formed a substantial part of their dowries among working and professional classes. Between linen fiber’s toughness to prepare, resistance to change, longevity in use, and value to owners, it becomes evident that the element of Earth is its native home. Wool is the long hair of sheep and other hairy mammals—cashmere is the hair of the cashmere goat, angora the hair of angora rabbits and goats, and camel’s hair is just that. Almost any long-haired domesticated animal around the world has been shorn or combed for its wool: musk ox, llama, dog, rabbit. Just as these coats and fleeces insulate and protect the animals from cold or wet, strong sunlight or high winds, so do those shorn fleeces and clipped hair provide humans with fibers able to lend us those same protections. Wool has the significant virtue of keeping one warm even when wet. Lanolin, the natural fat present in sheep’s wool (unless scoured out), is water-repellent, for one thing. Moreover, the microscopically kinked and scaled fiber surfaces maintain trapped air pockets throughout the fiber, which act as insulation regardless of how wet it is. Such insulation effects historically have served inhabitants of Saharan regions against the desert heat and chill, as well as inhabitants of the sea-faring peoples of the British Isles and Europe. Caption: A half-shorn sheep demonstrates the amount of wool produced by one sheep in a single year. Thus, a defining quality of wool is its antipathy to fire and flame and ability to retain or protect against heat. Taken together with its ability to insulate human and animal against the chill of wet weather, Water is its innate element. Remember, Water is the polar opposite of Fire. The cotton boll is the fibrous outer coating of the seed pod of a genus of tropical mallow plants, Gossypium, requiring tropical climates, or hot subtropical, to flourish. Its light, open structure burns easily, cleanly, and quickly. Caption: Cotton ready for harvest. The fine, light cellulose fibers of the cotton boll form the means of wind-distribution to spread those seeds. That same fineness enables the spinning of extremely fine threads. Such fine threads in turn allow such closely woven lightweight fabrics. Such finely woven cloth makes up into cool, breathable clothing and bed-clothes. Modern cotton sheets often specify the thread-count per square inch on their packaging. Egyptian cotton, an extra long staple (natural fiber length) cotton, was used in clothing from at least as early as 3600 BCE. Our very word gauze is believed to originate with an Arabic word, and physically, gauze weaves of cotton resemble the “mist linen” worn by Pharoahnic Egyptian nobles, as depicted in a goodly number of tomb paintings there. Similar quality long-staple Pima cotton was grown for clothing and decoration among the pre-Columbian peoples in south America—surviving examples of Pima cotton textiles there date to as early as 4400 BCE. Today, hot- and warm-weather garments are almost exclusively made of cotton fabrics. Absorbent cotton has allowed humans to work in tropically hot and humid conditions, such as the British Raj in India, exhibiting almost a magical affinity to both use heat and protect one from heat. And candle and lamp wicks are now made of cotton almost exclusively. This affinity for Fire defines the native elemental correspondence of cotton. Commercial silk is the fiber spun by the larvae of an Asian moth, Bombyx mori, when it becomes a pupa, spinning as much as a mile in a single cocoon. The fineness of the silk fiber when unravelled is so great that a single filament of silk was used to create one standard (a denier, used to measure linear mass density) for comparing fibers. An airborne creature for the element of air—seems obvious, no? 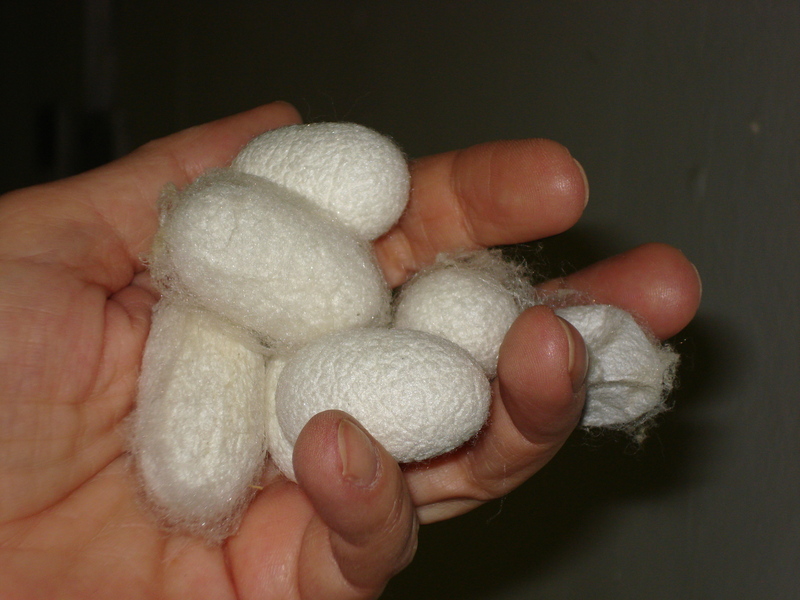 Most sericultured (the technical term for raising Bombyx for silk) silk is made from killed cocoons, though silk noil or raw silk is made from hatched cocoons, as is wild silk. Those intact cocoons allow the thinnest of fibers, sometimes as fine as a mere three filaments to a single thread (before spinning or plying). Caption: A handful of cocoons ready to unreel. If you’ve ever handled the type of silk fabric called habotai, or the silk kerchiefs used by jugglers, you’ll have a sense. And those kerchiefs seem to defy gravity as they take their time when novice jugglers learn how to snap their wrists with each toss upwards, allowing the kerchief to expand in its own breeze and thus drift, not drop, earthward again. The silk fiber consists of a continuous protein chain, making it extremely strong for its weight. Spider silk, at about one-tenth the denier and one-fourth the diameter of silk, is considered to be the world’s strongest natural substance, based on materials standards of tensile strength-to-weight ratios. This extreme light weight and equally extreme strength of silk made it the fiber (and thus fabric) of choice when early experiments with lighter-than-air craft took place in the early 19th century. L. Frank Baum’s 1904 description of the Wizard’s vari-colored green balloon in the first Oz novel specifies panels of fine silk fabric. The term “parachute silk” is still used in some circles, although nylon supplanted silk in parachutes and similar applications during the Second World War. Silk fabrics can be extremely lightweight and compressible. So much so that a 19th-century test for lingerie quality was to pass a woman’s full-skirted, many-tiered silk petticoat completely through a wedding ring. At the same time, silk woven into heavier fabrics (noil, dupioni, etc.) such as are used in suiting or upholstery resembles wool in its ability to insulate against warmth or cool. Just as young spiders disperse from their hatch sites by spinning a bit of gossamer to the breeze and riding the flying filament(s) to their new homes, a living bit of thistledown, so does the silk gossamer of the Bombyx moth enable it to fly to its native element of Air. ©Deborah Snavely, 2006, 2015, all rights reserved. This entry was posted in About Wicca, British Traditional Wicca, Fibers, Paganism, Wicca, Witchcraft and tagged British Traditional Wicca, correspondences, cotton, elements, fibers, linen, natural fiber, silk, wica, witch, wool on September 13, 2015 by Deporodh. I learned a great deal from this article. Thank you for sharing it! You gave me wonderful new ways to think about fabrics when crafting for pleasure or practical use. Blessed Be!